John Krenicki Jr. is a senior operating partner with Clayton, Dubilier & Rice, one of the world's leading private equity investment firms. He joined the firm in 2013 after a 29-year career at General Electric. He is a former vice chairman of GE and former president and CEO of GE Energy. His responsibilities included oversight of GE’s Oil & Gas, Power and Water, and Energy Management businesses, which employed more than 100,000 people in over 165 countries and represented more than $50 billion in revenue. Prior to leading GE Energy, he was president and CEO of both GE Plastics and GE Transportation Systems, and he served as a director of GE Capital. In addition to his role at Clayton, Dubilier & Rice, Mr. Krenicki serves as chairman of Wilsonart International, chairman of Brand Industrial Services, chairman of Power Team Services and lead director of NCI Building Systems. 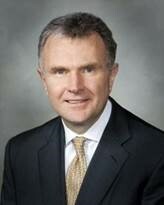 He also serves as an independent director of Devon Energy Corp. and as a member of the National Petroleum Council. Mr. Krenicki has a bachelor’s degree in mechanical engineering from the University of Connecticut and a master’s degree in management from Krannert Executive Education Programs. Mr. Krenicki and his wife, Donna, made major gifts to establish the John and Donna Krenicki Directorship of the Purdue Institute for Integrative Neuroscience and the Krenicki Family Directorship in Inflammation, Immunology and Infectious Disease. These institutes pursue research to alleviate suffering associated with trauma, disease or disorders of the brain and nervous system and the diagnosis and treatment of many of the world's most common diseases.